Cork is a short muskrat who likes to help out. Fuzz is a tall possum who likes to help himself. 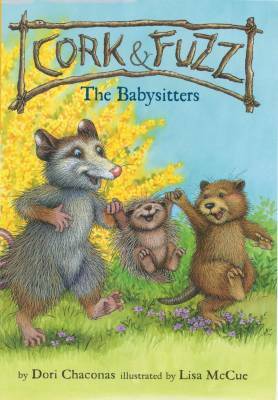 Cork is babysitting for a porcupine, and he needs Fuzz's help. Fuzz says he's too busy. 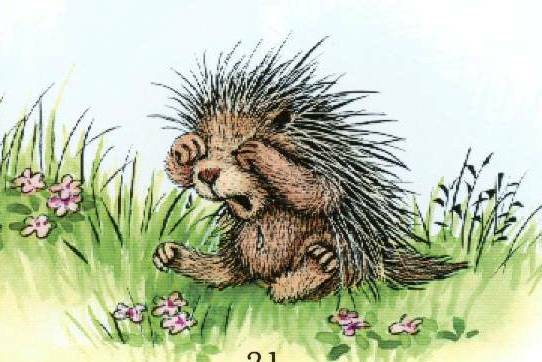 But when the baby porcupine goes missing, it is up to Fuzz to help find it! The whimsical story and playful illustrations in this sixth Cork and Fuzz easy-to-read title are sure to delight young readers. It's always a challenge to come up with a plot and theme for a new Cork and Fuzz story. The two characters need to experience things that kids can relate to, as well as the emotions a kid might go through when doing something fun or something not so fun. At the same time, Cork and Fuzz, being animals, have to stay true to their natures and environment. It might be fun to have Fuzz learn to ride a bike, but riding a bike isn't a natural thing for a possum to do. The same with other things young readers have suggested, i.e. CORK AND FUZZ MEET A DINOSAUR! CORK AND FUZZ GET KIDNAPPED BY ALIENS! or CORK AND FUZZ TAME A LION! Sorry, guys, those things just aren't possible in Cork and Fuzz's world. But we will keep trying to come up with some fun and interesting plots, so keep reading!